Although sleep-inducing and ultimately unmemorable for adults, Dr. Seuss' The Grinch is nonetheless the perfect sleigh ride to usher in the Christmas spirit for the little tykes in the family. 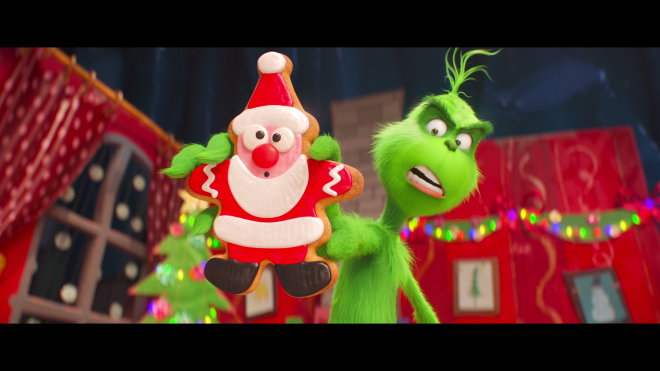 The Grinch sleighs into home theaters with a reference-quality HD presentation, an excellent Dolby Atmos soundtrack and a decent set of supplements. The overall package is Worth a Look for the fans. You can read our full thoughts on Illumination's Dr. Seuss' The Grinch in our review of the 4K Ultra HD Blu-ray HERE. 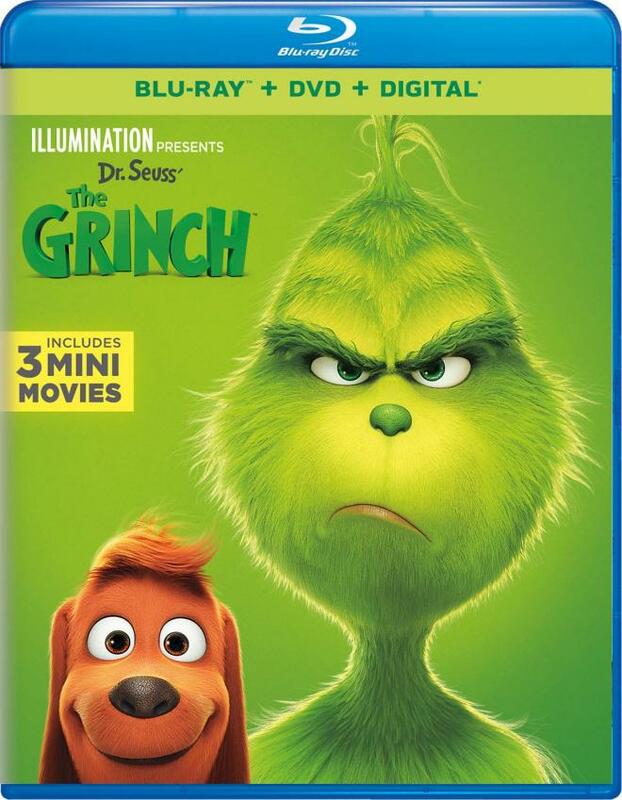 Universal Studios Home Entertainment brings Dr. Seuss' The Grinch to Blu-ray as a two-disc combo pack with a code for a Digital Copy. The Region Free, BD50 disc sits comfortably opposite a DVD-9, and both come inside a blue, eco-elite case with a glossy embossed slipcover. After several skippable trailers, viewers are taken to Universal's standard menu screen with the usual options on the left, full-motion clips and music. 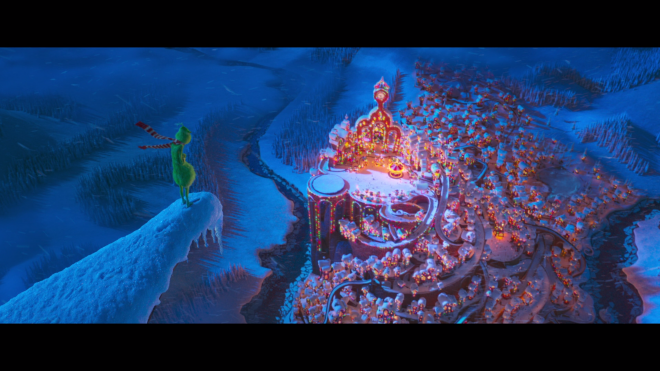 The Grinch sleighs into home theaters with an absolutely stunning, reference-quality 1080p/AVC MPEG-4 encode that bursts with a gorgeous parade of colors right from the start. 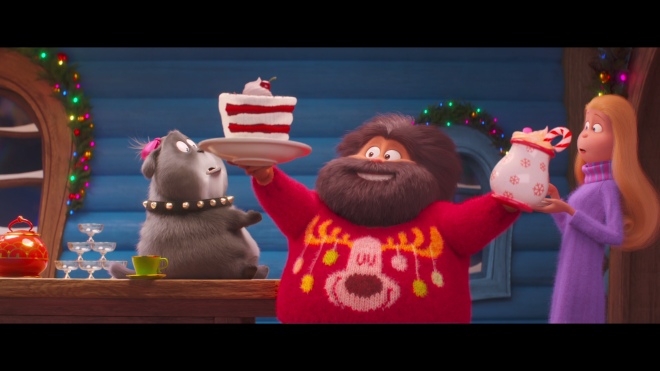 Our scruffy, wooly anti-hero is a brilliant, shining green while also oddly feeling sickly and nauseating, of a distinctly different blush than the deeper pine and juniper of the surrounding foliage and the ginormous Christmas tree. The holiday decorations and houses are a radiant cherry red, and the sky is an intensely glowing cerulean blue. The rest of Whoville is awash in sumptuous, alluring secondary hues and mesmerizing pastels. Meanwhile, spot-on contrast delivers dazzlingly crisp, comfortably bright whites in the snow, making the individual ice crystals sparkle and glisten in the sunlight. Inky rich blacks shower the darkest corners with luxurious, midnight shadows without ruining the finer aspects. All the same supplements are ported over from the day-and-date UHD release, which can be read in more detail in our review of the 4K Ultra HD HERE. For the parents and family members dragged into cinemas forced to sit through the third adaptation of the classic children's book, Dr. Seuss' The Grinch is a sleep-inducing chore offering nothing worthwhile or memorable. 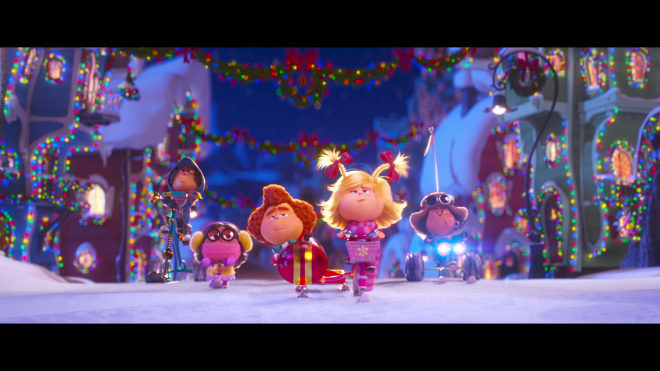 However, for the little tykes ready to welcome the holiday season, the surprise box-office smash is the perfect sleigh ride to usher in the Christmas spirit. 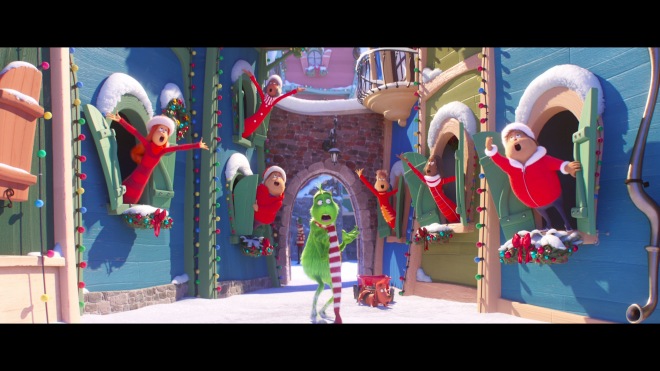 The Grinch brandishes his evil grin and steals Blu-ray with a stunning, reference-quality HD presentation while complemented by an excellent Dolby Atmos soundtrack. With a decent but still average set of supplements, the overall package is worth a look.